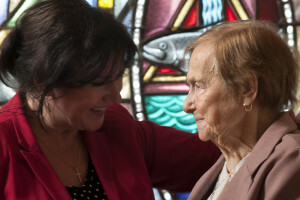 Holy Family Home which continues to be owned and operated by the Sisters Servants of Mary Immaculate, is entering an exciting time in its history as an accredited personal care home for the elderly. Holy Family Home provides a full range of services (from personal care to community services), and is a hub for community life. Holy Family Home is a place where loving care and compassion are provided to the most vulnerable senior citizens. Currently there are 276 residents who live at Holy Family Home, along with the many others who access their community programs. The resident profile has changed dramatically over the recent years and will continue to change in the future. Although the care that is provided at Holy Family Home is outstanding, the most loving care can still fall short when the current facilities are no longer adequate to meet the needs of the resident population. Residents are presenting with clinically complex care needs, requiring a high level of quality resident care. It is also very important that Holy Family continues to provide a home-like environment, as this is the final home for the residents. Approximately 80% of the residents have dementia or dementia-related conditions, which require the familiarity of a home-like environment. With these diverse, complex and ever-changing needs, it is extremely difficult to adapt care plans and respond to challenging social situations in a facility that is no longer suitable for current, let along future residents. In 2011, the Premier of Manitoba announced an expansion project for Holy Family Home that will include a new 157-bed building and revitalization of the existing facilities. This exciting news is a part of the government’s strategy to increase the number of personal care home beds in the province.